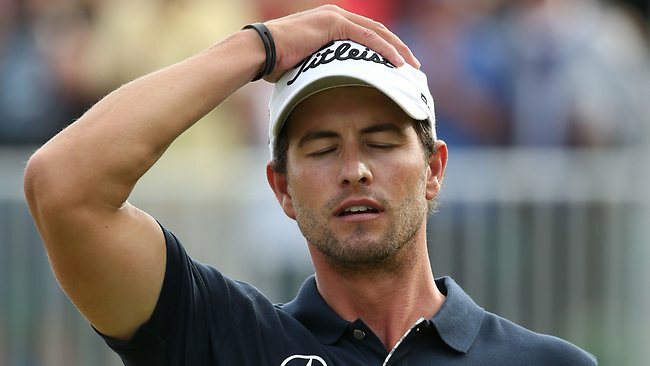 And just yesterday, I was pre-celebrating Adam Scott's victory. But yet there were strange unexplainable happenings and disappearances (of game) on the British links. Stonehenge-type stuff. And even thru 14 holes today it was a sure thing. Backtime's editorial department headed to the local pool armed only with two children, a Twitter feed and an Elmore Leonard novel. The book didn't get much play as Scott's collapse played out in real time on my Android. And Ernie Els' fourth Major win almost seems like a footnote. Sunday demise is even more of a signature of this tournament than triumph. The 1999 saga of Jean van de Velde is the most famous debacle. Nobody remembers that he still forced a playoff, or that Justin Leonard was in it, or that Paul Lawrie won it. In 2003, Thomas Bjorn's late bunker blunders opened the door for unknown Ben Curtis, who had posted his number hours earlier. The next year, Els himself yipped a short putt to seal it, and Todd Hamilton of all people, ousted him in the playoff. In 2007 at Carnoustie, Sergio Garcia needed only a par on 18 to win and claim his Major, but he backed into a playoff with Padraig Harrington, and predictably lost. And then in 2009, 59-year old Tom Watson's story for the ages was derailed by a poor 72nd hole, and he was blasted in the playoff by Stewart Cink. How Scott's career trajectory goes from here is anyone's guess. Rory McIlroy imploded at the 2011 Masters, then won the U.S. Open in a tour de force just two months later. So hang in there, Scotty.